All pixels that are not labeled can be adjusted using the sliders in the Unlabeled section, to get them to match the other edits you have made. It is best to roughly make your area selections and return to the Add & Edit Areas selection at a later stage if necessary. Often, you can greatly improve a picture with fairly subtle changes. Push the sliders up just far enough to get the results you want. If you go too far, the result can look unnatural or fake. If you are making more dramatic changes to your image you will need to spend more time selecting the areas. LandscapePro uses your areas to calculate a depth map. The depth map is used for Lighting, Depth Of Field and Depth. To get these sections working as well as possible, tall objects should be labeled. 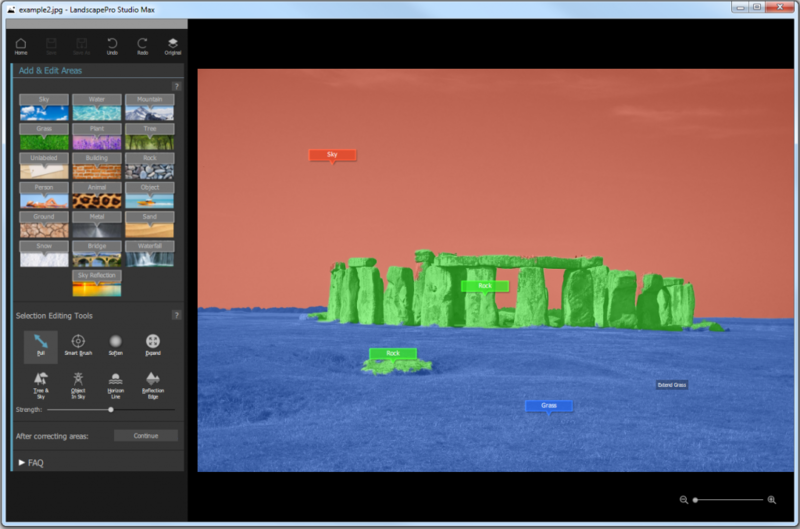 LandscapePro uses the horizon line to work out which objects are tall by looking at which go above the horizon. If you are looking down on a scene, placing the horizon line lower than it should be may give better results because tall objects might not reach the horizon in the image. If you want to return to the editing process later and reload your image and continue adjusting the sliders, you will need to save a Session file. In LandscapePro this is a .lp3 file. This saves the original image, all the area selections, and all the sliders values into a proprietary “.lp3” file. These .lp3 files can only be opened in LandscapePro. It is best to roughly make your selections and return to the Add & Edit Areas section later if necessary. LandscapePro uses your areas to calculate a depth map. The depth map is used for Lighting, Depth and Depth of Field adjustments. To get these sections working as well as possible, tall objects should be labeled. LandscapePro uses where you placed the horizon line to work out which objects are tall by looking at which go above the horizon. If you are looking down on a scene, placing the horizon line lower than it should be can get better results because tall objects might not reach the horizon in the image. 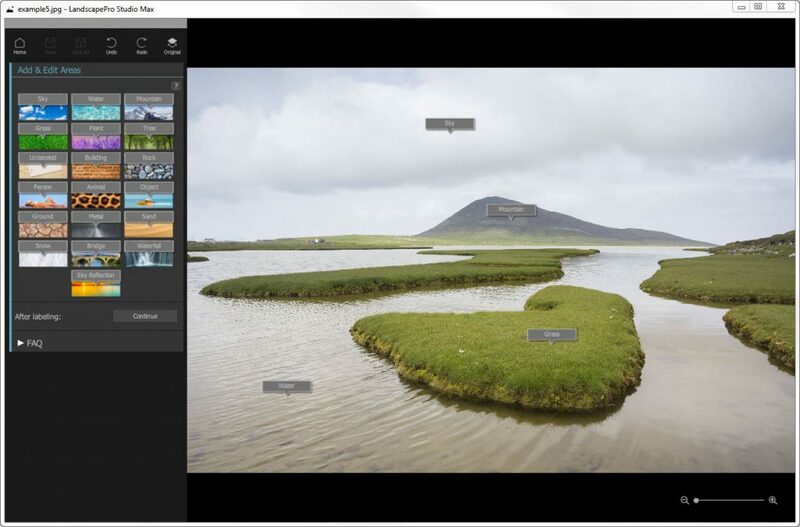 If you want to return to the editing process later and reload your image and continue adjusting the sliders, you will need to save a Session file. In LandscapePro this is a .lp3 file. This saves the original image, all of the area selections, and all of the slider values into a proprietary “.lp3” file. These .lp3 files can only be opened in LandscapePro.